At Apnea Treatment Center we have the opportunity to study and test many sleep-related products. We’ve recently poured hundreds of hours into researching the best sleep apnea pillow. And our research showed the EnduriMed CPAP Comfort Pillow deserves to be at the top of our best apnea pillow list. It provided the best collection of design features to allow it to perform effectively, whether you’re a side, stomach, or back sleeper. The E﻿ndu﻿riMed pillow’s﻿﻿ design, which includes channels for CPAP mask hoses, also makes it the best sleep apnea pillow for CPAP users. 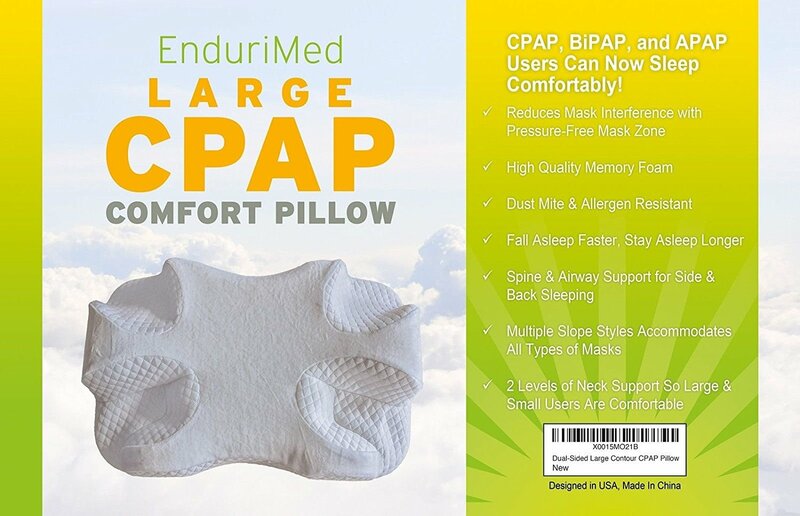 The EnduriMed CPAP Comfort Pillow is our pick for best overall sleep apnea pillow because it easily accommodates both CPAP users and sleep apnea sufferers who want a comfortable, supportive pillow that allows for sleeping on the side or stomach. Our additional research showed that the best sleep apnea pillow for neck support is the Therapeutica Sleeping Pillow. 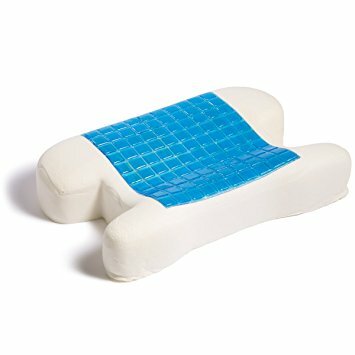 It may have an odd-looking design, but its center area fits the head well, making the Therapeutica Sleeping Pillow comfortable to use for back and side sleepers. And it is available in different sizes, meaning you’ll find the right pillow to fit your head. The side sleeping position is the best one for apnea sufferers, as they’re able to maintain an open airway in this position. And the best sleep apnea pillow for side sleeping is a small but effective model, the Womfy So Comfy Pillow. You can remove or add a riser in the pillow to adjust its thickness level, which is great for finding a comfortable position. Some people dislike memory foam pillows because they make the skin feel hot. So you may want to look for the best sleep apnea pillow with cooling gel to help with your obstructive sleep apnea. 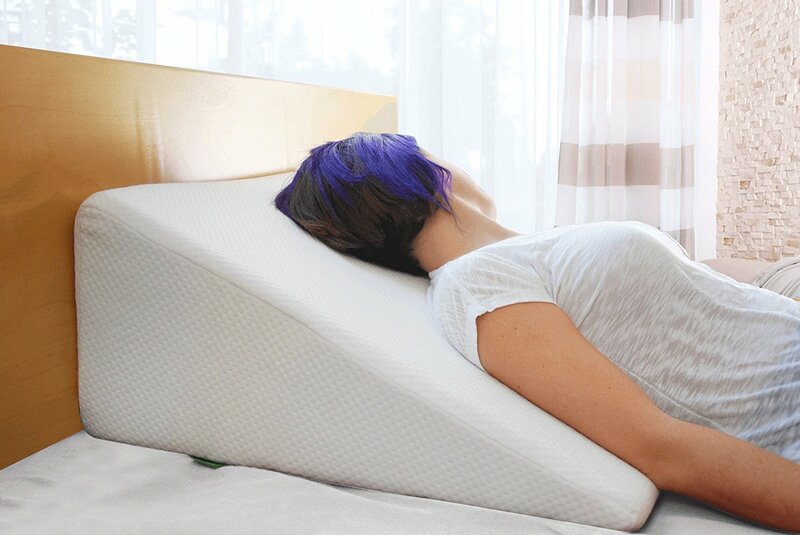 The cooling gel means the memory foam won’t cause you to feel hot, allowing you to sleep more comfortably all night. Our research found that the Relax Home Life Cooling Gel Pillow, with its layer of cooling gel, is extremely comfortable. The best contoured sleep apnea pillow is one that will provide great neck support. By properly supporting the head and neck, the pillow helps to keep the airway open, which minimizes apnea symptoms like snoring. Our research showed that the Sensorpedic sensorGEL Contour Pillow is the best contoured pillow on the market. It has two contour heights, allowing you to pick the most comfortable one, which is a great feature. Who Should Use Sleep Apnea Pillows? Positional pillows are meant to "position" your body so your airway stays open while you sleep – which might allow you to avoid using CPAP equipment. Cervical pillows (also called contour pillows) are a type of orthopedic pillow, which keep your body in a particular position while you sleep. In the case of cervical pillows for sleep apnea, the purpose of the pillow is to keep your head and neck in a position that keeps your upper airway open, so your throat doesn’t close while you’re asleep and oxygen is able to enter your body (hence, no sleep apnea). A bonus with cervical pillows is they can also relieve neck pain, shoulder pain, and headaches (if you experience those problems with your current pillow). while you sleep on your back, we recommend them only for side-sleeping – because sleeping on your back tends to make sleep apnea worse, as gravity causes your tongue, soft palate, etc to fall back into your throat. The biggest difference between a cervical pillow and wedge pillow is the angle – a wedge pillow elevates your upper body and does not allow you to sleep completely horizontally. dropping back into your throat). The elevation difference between a cervical pillow and wedge pillow is an important point to keep in mind. While a wedge pillow counter-acts the force of gravity and might keep your upper airway open as a result, will you feel comfortable sleeping with your upper body raised off your mattress? CPAP pillows are for sleep apnea sufferers who use CPAP equipment, and are meant to make it more comfortable to sleep with a CPAP mask. There are side-sleeping and stomach-sleeping CPAP pillows.How about CPAP pillows for people who sleep on their back? 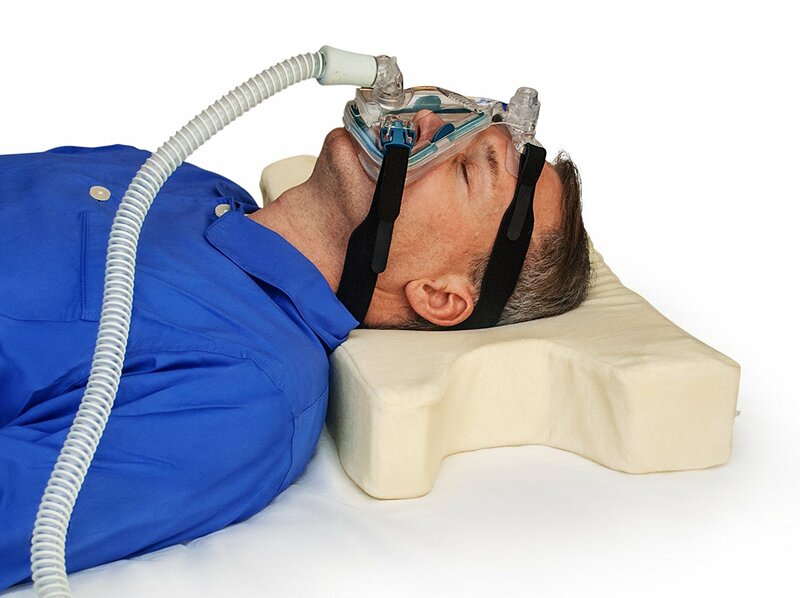 As with people who don’t use CPAP, if you sleep with a CPAP mask, your best bet is to go for a good wedge pillow, which will keep your upper-body elevated while you sleep. A sleep apnea pillow helps sufferers of obstructive sleep apnea (OSA). It's designed to force you to sleep on your side or stomach primarily, yet provide head and neck support while doing so. Those who suffer from snoring and apnea events typically experience a greater occurrence of these problems when sleeping on their back (or in the supine position, i.e. the stomach). 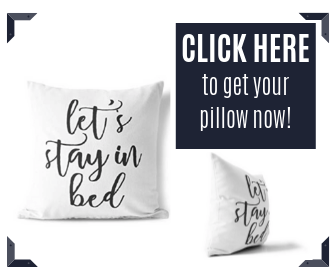 So having a pillow that encourages patients to remain sleeping on their side throughout the night can alleviate snoring episodes and apnea events. And for CPAP wearers, sleeping on the side allows the CPAP machine to deliver a lower treatment pressure throughout the night versus sleeping on the back. This means the wearer often receives a more restful night of sleep. Our best pillow for sleep apnea reviews and research has yielded five best options. Below you'll find a table that summarizes our ratings and who each pillow is best for. Then, in the following sections, we break down each product, identifying the strengths and weaknesses of each. 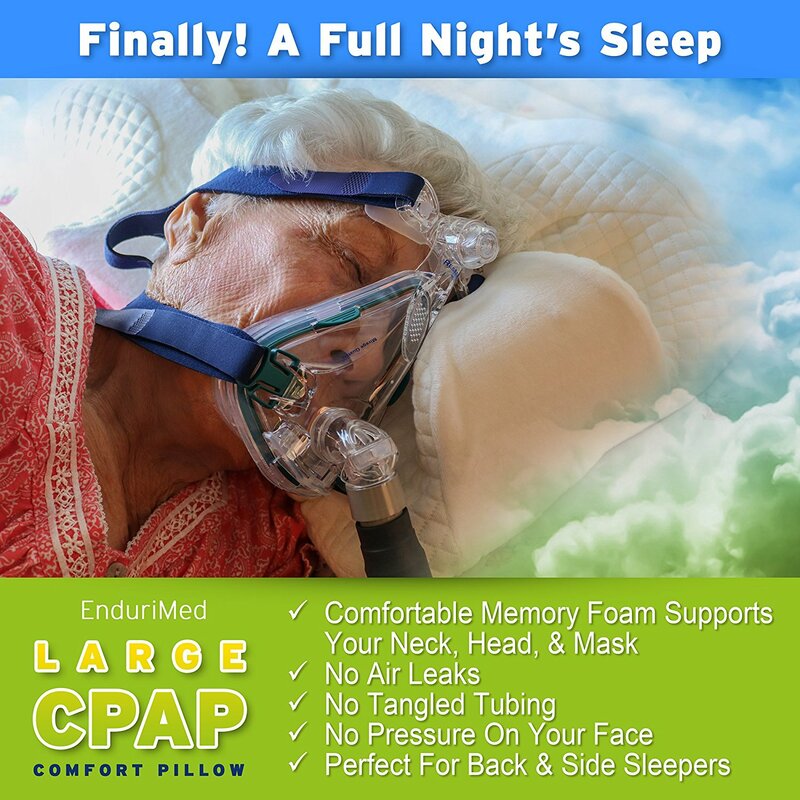 CPAP wearers will especially appreciate the EnduriMed CPAP Comfort Pillow. 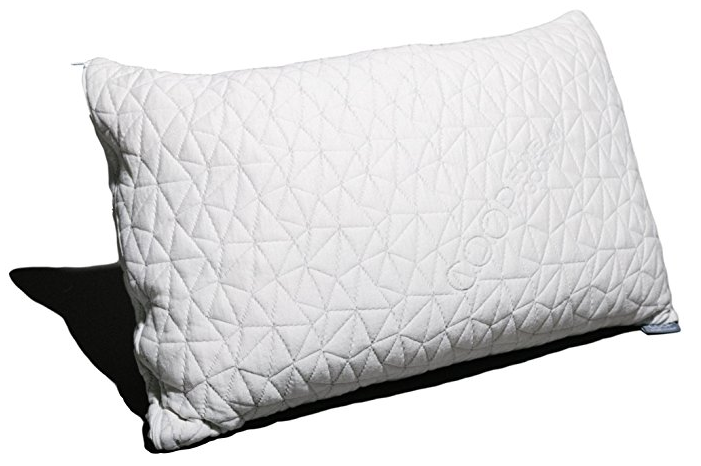 It uses its memory foam construction to keep its shape, making this pillow work well throughout the night. The reason the EnduriMed Comfort Pillow is a best sleep apnea pillow for CPAP users is because of the pillow’s design. It includes indentions in the corners, which allow for the hose to naturally remain in these channels while side sleeping. Consequently, this allows the CPAP mask to remain in place throughout the night. Even those who naturally tend to move a lot in the night will find the EnduriMed pillow’s design doesn’t shove the mask out of place. If you’re someone who finds the CPAP mask ends up crushing your nose in the night, this pillow fixes that problem. The design looks simple enough, but it works well. For those who tighten the CPAP mask to the point of being uncomfortable – attempting to keep it in place during the night – this pillow allows you to wear the mask at a normal tightness level. This is a really nice benefit of the EnduriMed pillow. And for those who don’t wear a CPAP mask, you can flip the pillow over and it’ll work just like a firm memory foam pillow. Even if you end up sleeping on the side of the pillow with the indentions, it might feel a little strange, but nothing too out of the ordinary! At about 1.7 square feet in size, it’s smaller than a standard pillow, and this size difference is noticeable, especially if you’re used to large pillows. From our research, it tended to take a few nights to get the hang of aligning the mask and the indentions in the EnduriMed sleep apnea pillow to gain the most comfort. So we’d recommend being patient with this product and giving the pillow time to work its magic. When we had our first look at the Therapeutica Sleeping Pillow, we were skeptical. It looks a bit like a torture device, rather than a comfortable pillow, thanks to its odd shape! But this is a case where looks don’t tell the whole story. This is the best sleep apnea pillow for neck support that we’ve found. airway open, meaning those who suffer from OSA are likely going to notice a drop in apnea episodes and snoring. The odd-looking shapes and contours won’t won’t work well for someone who sleeps on their stomach, but they’re great for back and side sleepers. Because apnea and snoring problems can be worsened by sleeping on the back, we’d recommend trying to use this pillow while sleeping on your side. Its design will be successful in keeping you on your side throughout the night. We wouldn’t recommend it for those who wear CPAP masks and sleep on their side or stomach. There isn’t anywhere for the mask’s hose to fit into the Therapeutica pillow’s contours. To make this pillow work well for you, you’ll want to measure your head and shoulders. Then look for the right size of Therape1utica pillow to fit your body, ranging from child size to extra-large. 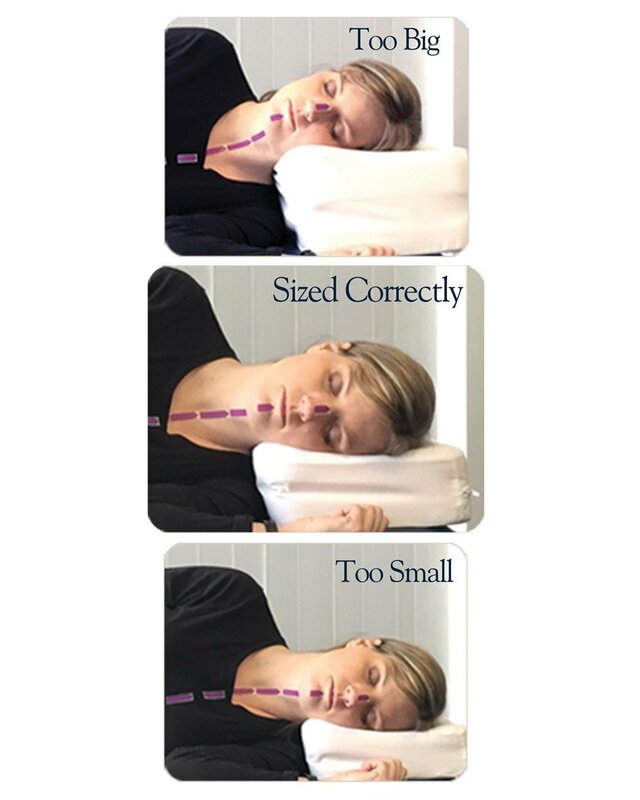 Having different sizes is a really nice feature, as it ensures comfort and proper alignment of the neck based on your body size. 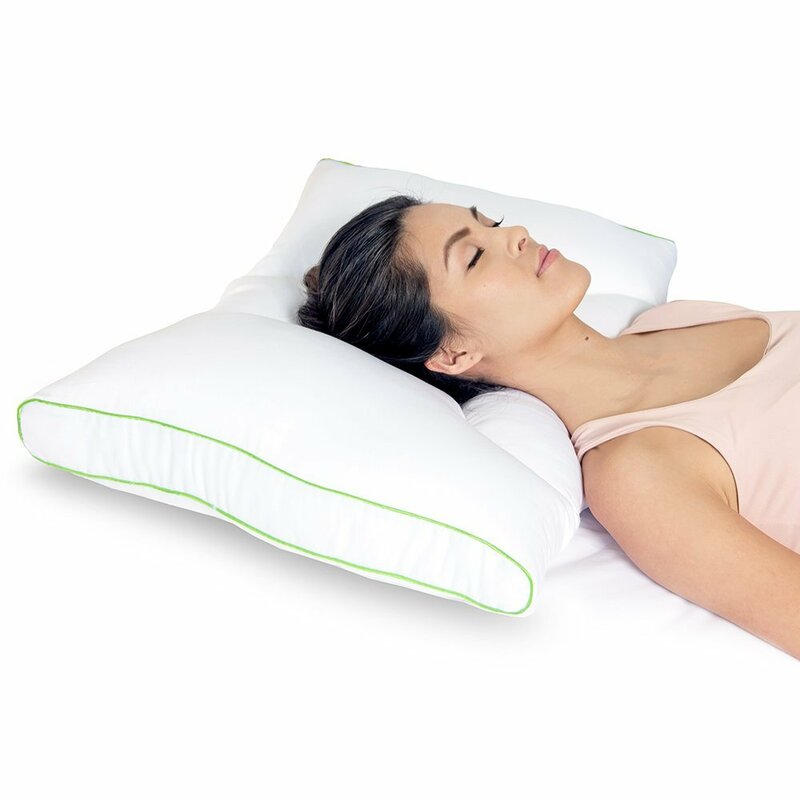 If you’re someone who changes your sleeping position often during the night, the Therapeutica pillow will be uncomfortable. It really only works well for those who don’t move around a lot while sleeping. And don’t give up on this design after one night. It takes a few nights to get used to sleeping on this contoured pillow comfortably. The Hypoallergenic Certipur Memory Foam Pillow may look a bit like a colonial-era hat, but its design is definitely modern. This odd design isn’t going to work for everyone in terms of comfort. But our research showed that those who find the Hypoallergenic Certipur Memory Foam Pillow comfortable end up swearing by it. Its user base is very loyal. You can make use of this pillow in thin, medium, and thick configurations, ranging from about 4 to 6 inches in thickness. The pillow has a removable riser inside that can be changed out to account for the varying thickness. Beyond the riser, the Hypoallergenic Certipur Memory Foam Pillow’s construction is memory foam and gel. For those sleeping on their sides, this is a great configuration for keeping the neck in alignment. It has just enough memory foam to keep the head in place, and the gel will keep your skin cool. Additionally, the CPAP hose fits well through the holes in the Hypoallergenic Certipur Memory Foam Pillow, making this pillow great for those who wear a CPAP and want to sleep on their sides. The Hypoallergenic Certipur Memory Foam Pillow also works well for those who need to sleep on their backs but want to minimize OSA events. Our research showed it’s not a great pillow for stomach sleepers. It just doesn’t provide great neck alignment for those who sleep on their stomachs. You may not like the size of this pillow, as it’s smaller than a typical pillow. It measures a bit less than two square feet. And some people might become frustrated with this pillow because finding the right thickness measurement is a trial and error process. But those that stick with the Womfy pillow really love it, so the trial and error process is worth the hassle. If you find most sleep apnea pillows to be too warm on your skin to use comfortably, the Relax Home Life Cooling Gel Pillow is aimed squarely at you. 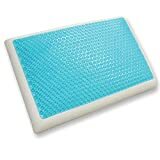 The Relax Home Life Cooling Gel Pillow provides a layer of cooling gel that covers the main section of the pillow, allowing for comfortable sleeping. Our research shows the Relax Home Life product is the best sleep apnea pillow with a cooling gel layer. And because the rest of the pillow is constructed of memory foam, it’ll contour well to your head and neck, providing plenty of support. Because of the way the pillow supports the head and neck, it’s not the best pillow for back sleepers. But for those suffering from apnea, sleeping on your side is recommended anyway. So it’s more important to find sleep apnea pillows that allow you to comfortably sleep on your side. The notches in the sides of the pillow work great for those wearing a CPAP mask, as the hose has a clear track to follow for the side sleeper. Because the hose will remain in place throughout the night, you won’t have to worry about having your mask slide out of position. It’s a little tough to find a pillow case that fits this product properly, because of the notches in the sides. If you don’t wear a CPAP mask, covering the notches with a standard pillowcase worked adequately in our research. Contour pillows tend to work well for those suffering from OSA, as they support the head and neck well. However, as most people who’ve used them know, they often become uncomfortable to use for long periods, as the foam used to create the contour of the pillow leaves your face, neck, and head feeling hot. That’s why we like the Sensorpedic sensorGEL Contour pillow so much. After all, a pillow that’s uncomfortable to use won’t be able to help reduce OSA events through the entire night if you’ve thrown it on the floor in frustration before midnight! The Sensorpedic pillow is made of memory foam, similar to other contour pillows. But the designers have infused the memory foam with cooling gel, which makes this a comfortable pillow. Because of its comfort level, we’ve found that the sensorGEL pillow is the best contoured sleep apnea pillow. We didn’t find that the Sensorpedic pillow is all that good for stomach sleepers, as the contours just don’t fit your face and neck well when sleeping on your stomach. But this pillow offers strong support for the head and neck for those sleeping on the back or sides. If you’re a CPAP mask wearer, the Sensorpedic sensorGEL pillow doesn’t have notches or channels for the hose. So it may not be the perfect apnea pillow for CPAP users who want to sleep on their sides. But if you always sleep on your back with your CPAP mask, this pillow’s contours really support the neck well, helping to keep the airway open and reduce apnea occurrences throughout the night. Finally, the two contours are of different heights. So you can use the contour that is most comfortable for you by just turning the pillow 180 degrees. Whenever discussing the best sleep apnea pillows, you’re sure to encounter someone who questions whether they actually work. The easy answer to this question is yes … with a few qualifiers. First of all, these pillows will work only for people who suffer from obstructive sleep apnea – not people who suffer from central sleep apnea. Those with OSA who also sleep on their backs run the risk of the tongue and soft pallette dropping toward the back of the throat, which obstructs breathing. Having proper neck and head support from an apnea pillow can help keep the airway open. Even better, a sleep apnea pillow can encourage you to sleep on your side (a “lateral” sleep position) and then stay in that position throughout the night. Changing your sleeping position to deal with the symptoms of apnea is called “positional sleep therapy”. Head and neck support. A sleep apnea pillow works well for supporting the neck and head. This allows the person’s airway to remain open more easily, which results in fewer apnea episodes during the night. Firmness of pillow. Going hand in hand with head and neck support is the firmness of the apnea pillow. Our research clearly showed that firmer pillows are able to provide support for longer periods more effectively than a softer pillow. 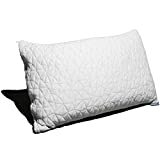 The soft pillows tend to collapse and lose shape during the night, which means that, although you may have had good support when you fell asleep at 10 p.m., it’s gone a few hours later. If your apnea pillow doesn’t have a high firmness level, it won’t work well. Avoid back-sleeping pillows. If the pillow that claims to help reduce sleep apnea is a pillow that only provides the most comfort for back sleepers, it probably won’t help much with apnea. Back sleepers tend to experience apnea symptoms because the tongue and soft palate often end up obstructing the throat in that sleeping position, blocking the airway. Side sleepers tend to have the most improvement in their apnea symptoms, followed by stomach sleepers, so make sure any sleep apnea pillow you pick offers support for side or stomach sleepers. Don’t forget about comfort. Pillows with memory foam tend to feel hot on the skin after a few hours of usage. And some pillows may have contours or shapes that simply don’t fit your body well. If your pillow is not comfortable, it doesn’t matter how well it’s able to reduce sleep apnea symptoms – you’re not going to use it. If your sleep apnea pillow can check the boxes on these key features, it should work to reduce apnea symptoms during the night. If a pillow claims to be a sleep apnea pillow, yet it is made of soft materials, it isn’t going to work as well. Sleep apnea pillows can work well for almost anyone who suffers OSA symptoms. Sometimes doctors will recommend that people with serious apnea symptoms use a sleep apnea pillow in conjunction with wearing a CPAP mask. Using both items in combination can give apnea sufferers the best ability to deal with these symptoms successfully. Snorers. Snoring is a common symptom for sleep apnea sufferers. The apnea pillows will provide the kind of support to the head and neck of the sleeper that forces the person’s airway to remain in proper alignment and stay open while sleeping, which should reduce the snoring episodes. CPAP wearers. Many sleep apnea pillows contain channels and notches that accommodate the hose on the CPAP mask, allowing it to remain in place for a side sleeper. Side sleepers. Sleeping on the side is the best way to reduce OSA episodes during the night. So if you’re someone who has trouble staying on your side throughout the night, a sleep apnea pillow can force you to remain in this sleeping position. It will have contours that keep you in the optimal sleeping position. 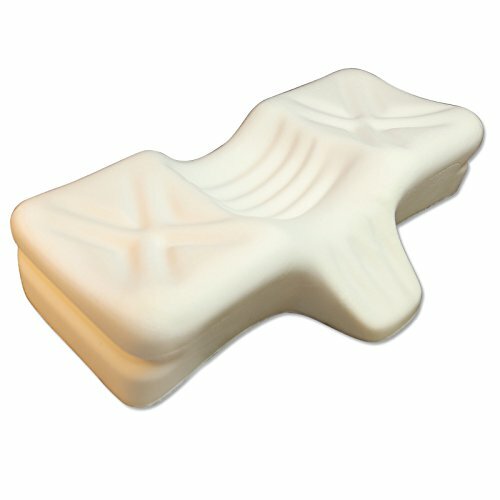 And the memory foam used in apnea pillows mold to your body and head, keeping you in your original position. Stomach sleepers. Sleeping on your stomach isn’t the best way to avoid apnea symptoms, but it is better than sleeping on your back. If this is your preferred sleeping position, look for one of the best sleep apnea pillows that’s recommended for stomach sleepers to find one that can make this sleeping position work for you. Feeling hot. Understand that your face and neck may feel hot after sleeping on these pillows because of the memory foam used in them. Incorporating cooling gel into the pillow can help with this problem. Staying comfortable. Ultimately, the biggest problem people encounter with sleep apnea pillows is a lack of comfort. Sometimes the contours of these pillows won’t fit a particular person’s body well. Other times, the pillows may just be too firm for some people. Look for one that matches your favorite sleeping position. Don’t give up too fast. The best advice we can give based on our research is to not give up on a particular apnea pillow after one night. Sometimes it takes a few days to find the most comfortable way to use an apnea pillow or to become comfortable with using a new sleeping position. Q: Why do I want memory foam in my sleep apnea pillow? A: Memory foam does a nice job of providing support for the head and neck, because it holds its original shape well while also matching the shape of your body. For apnea pillows with notches and contours, memory foam is the best type of material to use for the pillow to hold its shape. Unfortunately, memory foam can make the skin in contact with it feel hot after a few hours, so manufacturers often include cooling gel as part of the pillow. As an added bonus, memory foam doesn’t have the allergy concerns of some other pillow fillers. Q: Do I really need a special pillow for use with a CPAP mask? Why doesn’t my regular pillow work? 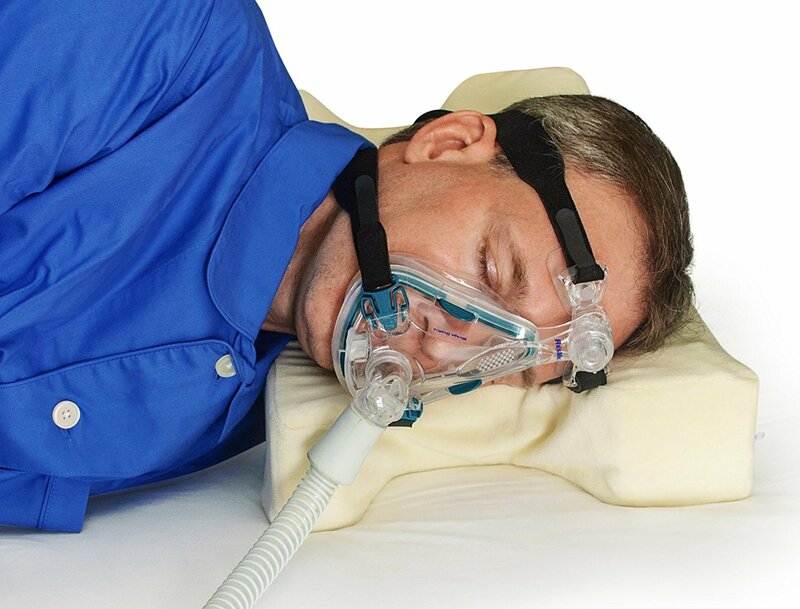 A: Many of the best sleep apnea pillow products in our list are designed specifically for those who wear CPAP masks. A regularly shaped pillow doesn’t have channels or notches that provide a path for the mask’s hose to follow for side sleepers. This means the hose could become tangled with the pillow, causing the mask to move during sleep. This will affect the seal of the mask, leaving it unable to perform adequately. Apnea pillows designed for CPAP mask wearers will do a better job of preventing the mask from slipping out of place than a traditional pillow when sleeping on the side or stomach. Q: How do I know which sleep apnea pillow is right for me? A: Start by understanding what you need the pillow to accomplish. If you’re a CPAP mask wearer who struggles to keep the mask from slipping during the night, look for a pillow with channels and notches that can help keep the mask in place. Also think about your preferred sleep position. 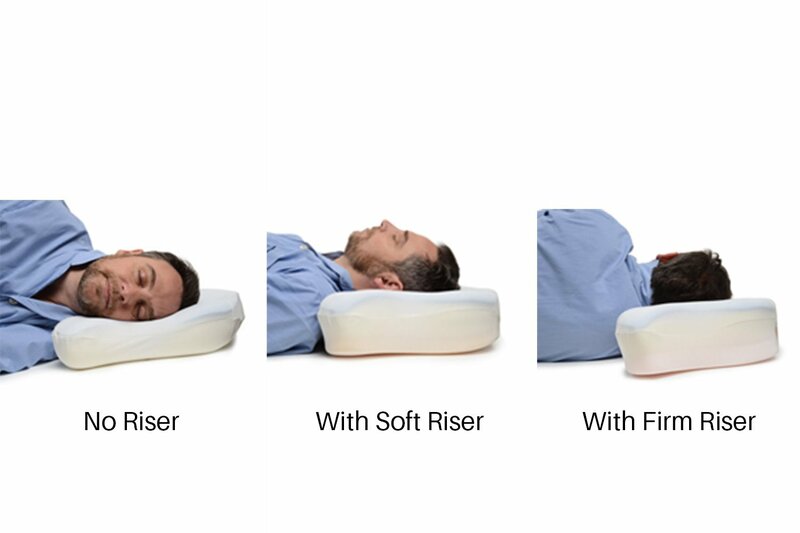 Some sleep apnea pillows are better for side sleepers than stomach sleepers, for example. Think of it like a sleep apnea position pillow that will match the sleeping position you prefer. Q: How do I know if a sleep apnea pillow is helping me? A: You should feel more rested during the day after using a sleep apnea pillow, because the pillow should reduce apnea events throughout the night, especially OSA events. Additionally, if these pillows are working, you’ll notice less neck and back pain because of the support these pillows provide for the head and neck. Finally, if you start the night sleeping on your side, you should wake up on your side too, as the apnea pillow should help you maintain your original sleeping position. Because these sleep apnea pillows primarily will help those with mild-to-moderate obstructive sleep apnea, you may want to consider some other products and therapies that can help with more severe apnea symptoms. Chin strap. A chin strap is a simple device that keeps your jaw in the forward position, maintaining an open airway during sleep. Nasal strip. A nasal strip is a very basic device for keeping the nasal passage open throughout the night. It definitely can help reduce snoring symptoms. Mouthguard. Also called a dental appliance, a mouthguard can help keep your jaw or tongue in place, so they don't block your airway during sleep (which is a surprisingly common cause of sleep apnea). Sleep apnea exercises. Exercises of the mouth, throat, tongue, and soft palate can strengthen your upper airway. Theses exercises have been shown in clinical trials to eliminate (or significantly reduce) sleep apnea. Yoga breathing exercises. Practicing yoga techniques can help you train your body to breath better, increasing lung capacity and strengthening breathing muscles. This may help with OSA symptoms in the night. Diet. If being overweight is contributing to your sleep apnea, one of the most effective things you can do is change your diet to lose weight. The best sleep apnea pillows are able to properly align your head, neck, and spine. This helps to keep your airway clear during the night, allowing you to sleep more peacefully, while also limiting the number of OSA episodes you’ll have. And these pillows can help you reduce related conditions like snoring too. Our extensive research into this category led us to name the EnduriMed CPAP Comfort Pillow as the best sleep apnea pillow. It works well in every key category for apnea sufferers, including the ability to support CPAP mask wearers and to encourage side sleeping. But that doesn’t mean that the other pillows in our best apnea pillow product matrix don’t have their strengths. Each type of pillow will work well for particular people and situations. particular needs. Think about the sleeping position that best suits you. 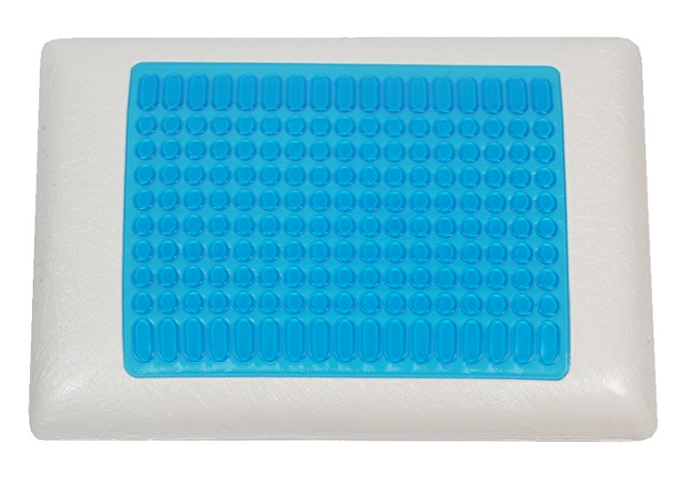 Do you need a memory foam pillow that includes a cooling gel layer? Or do you need a pillow that has a particular contour to it? As long as you take a bit of time to find the right sleep apnea pillow for your particular situation, you should have more success using this type of pillow. Use our research to help you figure out which pillow can help you the most!